4 Bedroom House To Rent in Horsham for £2,700 per Calendar Month. Gascoigne Pees are very pleased to offer this detached and unique property on the outskirts of the beautiful and historic St. Leonards forest in Colgate. The property is situated in an exclusive private gated development that consists of just 7 homes that are located a nice distance apart from each other, giving you a feeling of peaceful and private living. Upon entering the property, you are greeted by a large reception room which makes a fantastic living room. This room has patio doors giving access to the garden and a window to the front which make it a lovely light and airy room with the feature fireplace. The second reception room is currently being used as a dining room and would also make a good sized study or playroom. Heading through the house, you then enter a stunning modern kitchen dining room. This has been finished to a really high specification with white modern units including an island, integrated appliances and lovely white ceramic floor tiles. There is ample space for a dining table which makes this the perfect room to sit and eat your breakfast in the morning. Going through the kitchen you enter a beautiful conservatory looking over the south facing garden, this offers lovely entertaining space for summer evenings with friends or family..
Upstairs to the property you are offered a good sized double master bedroom with an ensuite bathroom, a second double bedroom also comes with its own en suite bathroom, there are two further good sized bedrooms and a family bathroom. 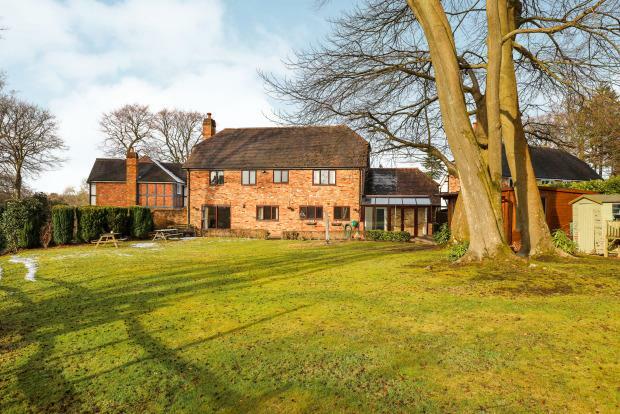 The garden of this property is a huge asset as it has been landscaped beautifully. It includes a pond which has a lovely wooden bridge over it and a lovely seating area with a bench. This is surrounded by trees and pretty plants, perfect for sitting reading a book and enjoying the sun. There is also a large lawned area which is great for the children to run around and play. With a double garage and driveway, you will never be stuck for parking! This property is available from the middle of December on an unfurnished basis. Long term lets preferable. If you require any further information or wish to arrange a viewing, please give us a call on 01403 282900.